This past Thursday, I attended my very first Warped Tour at the Tweeter Center in Mansfield, and I was not at all prepared for the complete chaos I experienced. It was a hot, sunny day full of sweaty crowds of kids, dehydration, exhaustion, near-deafness, and a bunch of bands I’ve heard of but have never heard. It took me almost two hours to figure out where all the stages were and where I could shoot, and practically the entire day to figure out who was playing where and when. Regardless, I ended up having a really great time. 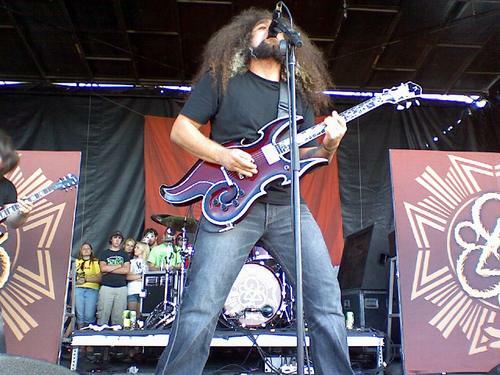 Next on my roster was Coheed and Cambria. When the band took the stage, I was amazed by the ridiculous head of hair on the lead singer, Claudio, and was also in admiration of his unique maroon guitar. They had more of an alternative sound, and Claudio’s voice had a uniquely high pitch. “The Running Free” had an upbeat sound with dark lyrics, but most of the instrumentation for their other songs sounded much darker. After Coheed and Cambria, it was finally time to see the one band I had waited several years to see in concert – The Starting Line. They are the only alternative/punk band I’ve liked for an extended period of time, and were the main reason I had wanted to go to Warped Tour, so I was thrilled that I hadn’t missed their set. 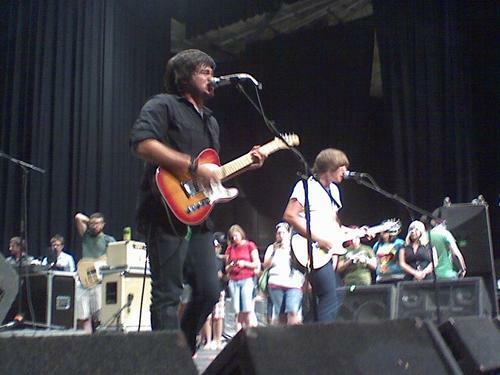 The band’s newest single, “Island,” from their newly-released Direction CD, was the first of their show. 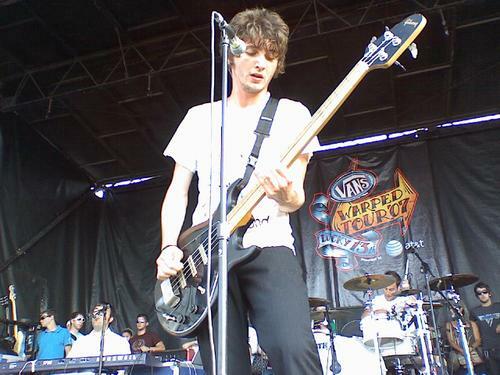 This is a very catchy, well-developed pop-punk song that genuinely displays how much more polished and mature frontman Kenny Vasoli’s voice has gotten since the band’s first album, and it sounded great live. Appropriately, “Making Love to the Camera” was the final song in my stint in the photo pit. 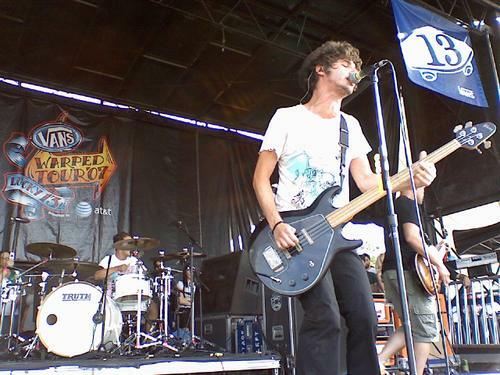 “Up and Go” and “A Goodnight’s Sleep”, which display The Starting Line’s classic pop-punk sound from their debut album Say It Like You Mean It, were also part of the set. The band also played an energetic version of “Way with Words,” one of the strongest songs on Direction. After Kenny announced: “We have two more left for your beautiful asses,” he riled up the Massachusetts crowd with this song dedication: “This song is about how I’m gonna break Tom Brady’s legs – no more Superbowl for that pretty boy.” One of the band’s angriest songs, “Surprise, Surprise,” from their second album, the Hollywood-themed Based on a True Story, followed. “The Best of Me,” the band’s anthem for teenage relationships and most well-known song, came last, and everyone in the crowd sang along enthusiastically. Even though I’m biased as a longtime fan of The Starting Line, I thought they put on a great show. Their live sound was a bit edgier and more energetic than their album sound, and I can’t wait to see them in concert again. After The Starting Line’s set, I decided to test my limits of my press pass, so I wandered over to the backstage entrance of the stage they had just played on. Apparently, my press pass was also an all-access pass, because security allowed me to walk backstage and right over to chat with sweat-drenched Kenny. I was in a much more positive mood and ready to conquer the rest of Warped Tour after this. 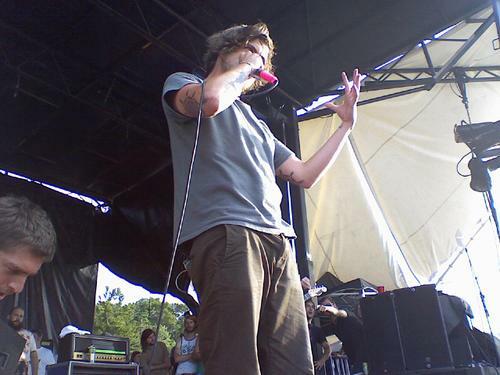 Next up on the main stage I stationed myself at was Circa Survive. I had heard a little of their music before, and I was pleasantly surprised at what I heard from them at Warped Tour. One of the most notable aspects of this band is the voice of Anthony, the vocalist, because it’s high-pitched and extremely unique compared to anyone else’s you hear in this type of alternative music. Anthony was fun/impossible to photograph, because of his ridiculous energy and outlandish dance moves. I don’t know how to accurately describe their sound, but I really liked it; their music was a mix of smooth, clear vocals with just a little screamo on top of some fresh-sounding instrumentals. The band got the crowd excited by encouraging a crowdsurfing competition, and then by starting a contest involving the free condoms that were being given out all around the festival grounds that day. Anthony told the audience that if they wrote their phone number on a blown-up condom and it made it onto the stage, he would pick a few of them, call the people, and give them a free t-shirt. 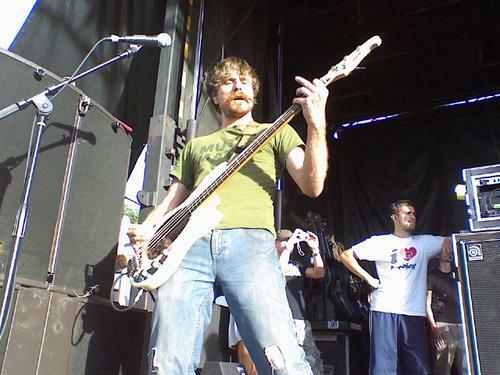 The other most notable aspect of Circa Survive was the bassist's handlebar mustache! I caught the final piano-based punk-pop song of The Rocket Summer’s set before heading over to see Paramore. Half of the people in attendance at Warped Tour were wearing their t-shirts, so I thought they would be worth checking out. Normally, I’m not much of a fan of female lead singers, but I actually loved Paramore’s sound. Hayley, the pop-punk band’s vocalist, is a young, tiny girl with an enormous amount of energy, a powerful voice, and some fluorescent yellow pants on this particular evening. All of their songs were catchy and upbeat; I especially liked “Misery Business." 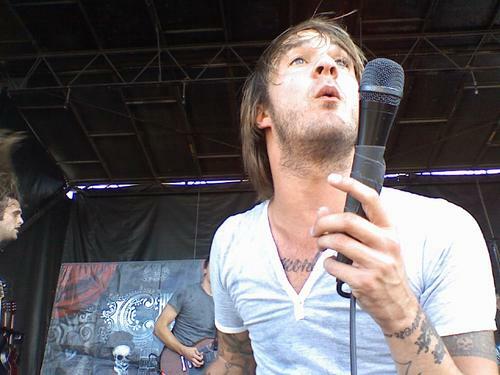 On the way over to one of the smaller stages, I saw Boston natives Boys Like Girls play their hugely popular single “The Great Escape” in front of one of the most excited crowds I had seen all day. Although I was almost too exhausted to stand, I managed to catch a few songs of one more band – The Spill Canvas. They were one of my favorites of the day, and I especially liked the smooth voice of the lead singer, Nick. I’ve been to festivals and other day-long shows before, but Warped Tour was a whole new experience. I don’t think I would’ve been able to handle the show if I had to brave the packed, crowdsurfing, mosh-pitting audiences all day, so I was very thankful for my press pass. Although the punk scene isn’t one I’ve ever been very involved with, I really enjoyed seeing what their concert experiences are like. I got to meet one of my favorite bands and hear some great new ones, so I would call it a good day (until the two-hour wait to get out of the parking lot). sounds like it was crazy there! Starting Line rocks! Can't say I have heard of all of the bands but maybe half! That handlebar stash is sick!! well, i know it was crazy there because you called me from it.. but wow that's a really good picture!! 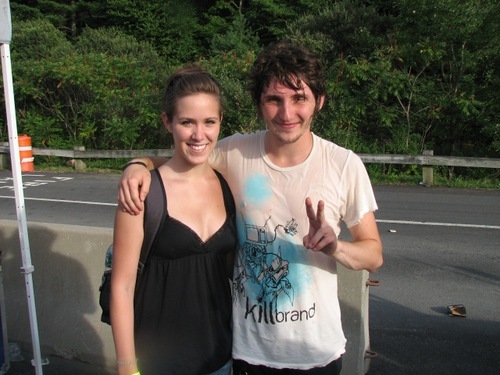 i'm glad you got to meet your favorite band, missy. Sounds like a wild time. Something that just had to be experienced. I'm not really familiar with any of these bands, but I'm sorry that I didn't get to go..Your pictures are awesome!!! Great review. It was a beautiful day and a little crazy but I had a great time. I love these Concerts and love being in the intensity of crowds ! Can't wait to read your next post!! Looks like you had a better time at Warped Tour than I have in the past. You write so well!! Keep it up! Sounds like it was a crazy time!! really well written. not a concert i would go to but im glad you did!! i was there and it was awesome!! Sweet pictures!! These pics shows are always out of control! sweet blog! 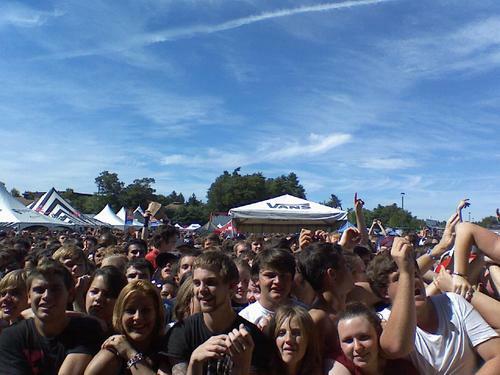 that picture of the crowd looks professional like it should be in the promo for the warp tour! dont stop writing! your awesome! AMAZING PICS! This concert sounds warped! What a wild day.